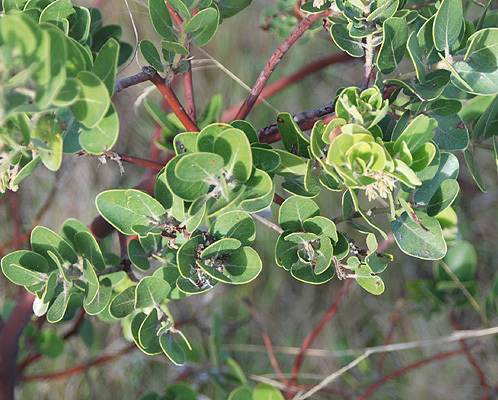 Broadleaf evergreen shrub, about 12 inches to 6.5 ft (30 cm to 2 m) ft (0.1-2 m) tall, stems erect to reclining on the ground with ascending tips, twigs densely tomentose and with long, white, gland-tipped bristles. 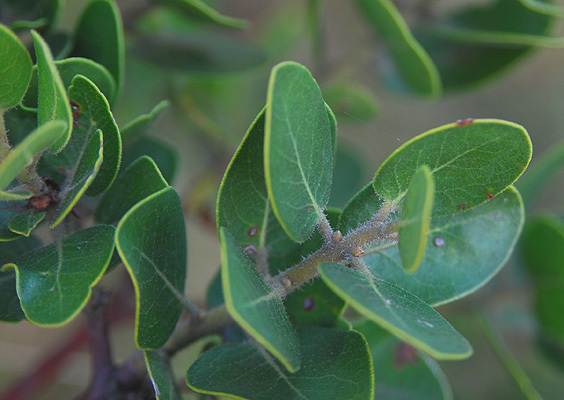 Leaves alternate, simple, overlapping, round to ovate, 2-4.5 cm long and 1.5-3.5 cm wide, base truncate or slightly lobed, margin entire or with short cilia, upper and lower surfaces similar, dull, light green, glandular to minutely pubescent, upper surface may be convex and without hairs (glabrous). Flowers white, sometimes pale pink, urn-shaped, crowded into terminal clusters. Fruit 8-11 mm wide, somewhat globose, sparsely hairy. Hardy to USDA Zone ? 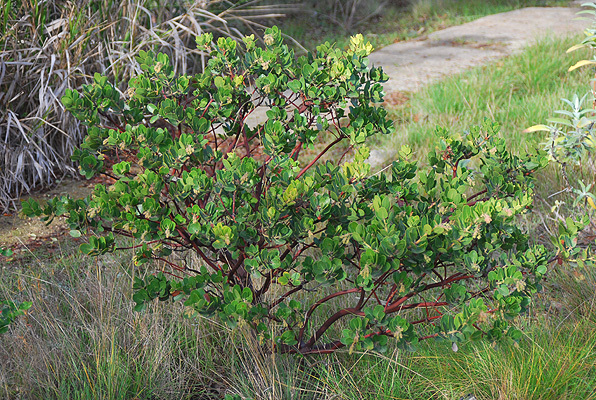 Native to the Channel Islands, i.e., Santa Rosa Island, off the southern California coast. confertiflora: with flowers crowded together.